Thanks to home-delivered meal kits, it’s easier than ever to put a delicious and home-cooked meal on the table for dinner each night. But, for those who are counting calories, it can be difficult to find options on each week’s menu that align with your daily calorie limitations. 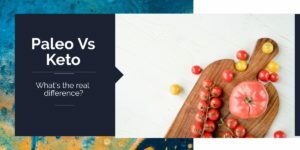 Fortunately, companies like Home Chef have recognized the growing demand for calorie conscious offerings, and they have an entire menu each week for people searching for low-cal options. Today, we’ll take a closer look at the Home Chef low calories meal plan. 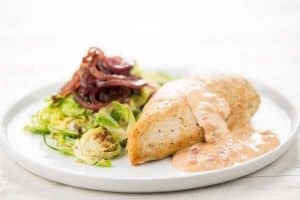 While Home Chef doesn’t offer plans catered to specific diets, they do a great job of offering a varied menu that includes several low-calorie options each week. Each week, there are over fifteen options to choose from, and there’s also a few add-ons’s that you can include with your food for the week for a small upcharge. Delivery is free provided that you’ve spent at least $45 per week. For orders under $45, shipping is $10 per order. There are a few huge benefits to subscribing to a low-calorie meal plan. First, and perhaps most importantly, meal plan services make it easy for you to cook delicious meals at home. Everything you need to make the meal arrives in the box pre-portioned with easy to follow recipes. You’ll be able to stick to your low-calorie diet without all of the added efforts of planning your meals and shopping for ingredients. Next, you’ll save lots of time in the process, especially when you’re adhering to a specific diet, like low calorie. With Home Chef, you can skip the trips to the store, skip the hours on Google scouring the internet for inventive new recipes, and you can skip all the time it would usually take to prep ingredients. Most people are forced to either burn an hour or two each day making dinner or settle for a quicker option that’s less healthy. With a meal kit service, you’ll be able to cut the time it takes to enjoy dinner in half, while still enjoying delicious and healthy meals. Another added benefit associated with meal plans is they reduce waste and spoilage, which are two major caveats usually associated with cooking at home. The containers your delivery arrives in are all recyclable or reusable, and you’ll never have to worry about food going bad because you over-bought at the grocery store. We tried Home Chef, and we were pleasantly surprised by just about every aspect of their process. Our delivery arrived in a well packed and insulated box. The box itself along with the packaging material within and ice packs are all recyclable, so you’ll be doing your part to support the health of the environment. When it was ready to tackle our first meal, it was as simple as consulting the recipe card, gathering the ingredients and following the instructions. The recipe cards were beautifully printed on heavy card stock, and they’ve made great additions to my recipe book. When browsing the menu, I figured a classic chicken dish like this one would be a great jumping off point, and Home Chef rewarded me for my decision. This healthy meal packs tons of protein while also being low in carbs, low in fat, and most importantly, low in calories. At only 542 calories per serving, this delicious meal definitely fits the bill for most eaters looking for Home Chef low-calorie meals. The recipe was easy to follow, and about forty minutes after I got started, I had a delicious chicken dinner on the table. While it wasn’t the most inventive dish I’ve ever had, it was fresh, flavorful, and perfect for spicing up a random Tuesday night. If you’re like me, you’re always up for scallops. While this is a premium recipe that carried a small upcharge, the extra few bucks were well worth the price of admission to enjoy this flavorful scallop dish. 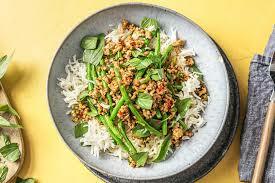 This dish comes in at 537 calories per serving, and it’s especially low in fat, which was perfect for my low-calorie diet. 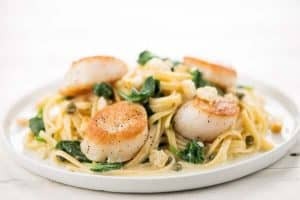 The recipe came together quickly and easily, and in just over a half hour, I had a restaurant quality scallop dish on my table. Best of all, I got to have pasta! 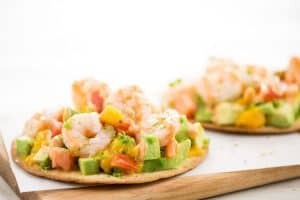 For my last selection of the week, I stepped outside my comfort zone slightly and took a shot at the Latin inspired ceviche-style shrimp tostadas. While I may have been in a bit over my head, the recipe made is incredibly easy to prepare every ingredient just right. Every ingredient was flavorful and delicious with just the right amount of spice. Plus, at only 576 calories per serving, I was able to enjoy a tasty and inventive dinner without screwing up my diet. 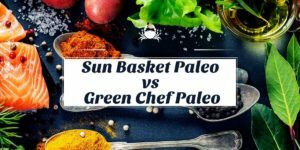 Meal kit services make it easier than ever to enjoy a home cooked meal, and thanks to companies like Home Chef, those of us who are watching our waistlines can also get in on the fun. Home Chef provides several low-calorie options each week, and each one I tried was delicious, inventive, and easy to make.